JOHN WOODLEY. The earliest Woodley ancestor we can feel sure of is John Woodley, who had a son baptised in Tedburn St Mary in 1586. There were Woodleys in Tedburn for centuries before that, but we have not identified which ones are his ancestors. A number of this family were well-to-do farmers. Tedburn St Mary is a farming community seven miles west of Exeter on the route to Okehampton. The Tedburn St Mary parish registers go back to 1557, but the early ones are badly damaged. Lines are missing from the bottom of many pages. We have not found John’s baptism. He may have been born before 1577 or the record may be among those lost. Another possibility is that he was born in another parish. 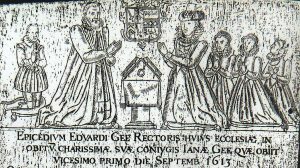 From the date of his son’s baptism, we should expect him to have been born around 1560, near the start of Elizabeth I’s reign. There is a document from that time which may contain his father’s name. Thomas Wodleyh and George Wodlegh were two of the feoffees (trustees) of the lands belonging to the parish church. They entered into an indenture with the churchwarden concerning the boundaries of these lands. One of these men could be John’s father. Since John named one of his own sons Thomas, the former is a little more likely. The feoffees would have been men of respected status. But there were also other men of that surname in the village. In the 1560s there are baptisms for children of Robert and Thomas Woodlye. Given the number of well-to-do Woodleys in the earlier records, we might have expected the Tedburn St Mary Muster Roll of 1569 to show at least one Woodley presenting the roll or featuring among the parishioners required to make an extra contribution of arms. In fact, there are three Woodleys, all of them simply pikemen: Richard Woodley, Thomas Woodley and Humphrey Woodlye. All able men over 16 were expected to be enrolled. Since John does not appear, so this puts his birth after 1553, unless he was disabled. Again, one of the three pikemen could be his father. They include Thomas, who may be the same as the feoffee. The parish registers show an extended family of this name, as we would expect for a line that had been in the village for centuries. There are early entries for the family of Robert Wodlye “of Oldridge”. This is a small hamlet around Oldridge Chapel on the high ground north of Tedburn. Oldridge was a chapel of ease for a detached part of the parish of St Thomas, across the Exe from Exeter. We do not know what part of the parish John lived in. One of John’s grandsons was named Augustine. Robert Woodley had a son called Scipio. The choice of these uncommon names strengthens the appearance of a family somewhat above agricultural labourers. We have no information about John’s mother or his own marriage. We have found the baptisms of two children. Johis is short for Johannis, the Latin form of John. This is followed two years later by the baptism of Thomas. 1588 was the year when the Spanish Armada was defeated. There are no more baptisms for children of John in this generation. In 1590 we have the burial of Thomasyne Wodlye. The burial register at this time does not say whose wife a deceased woman was. Thomasyne could be John’s wife. If so, the date would explain why there were no more children. O, that in Hymenaeus’ books I ne’er had been involv’d ! In faithfulness Penelope thou didst far surpass. The Act of Uniformity of 1558 required everyone to attend church once a week. The fine for absence was 12d. John would have attended St Mary’s every Sunday and on some feast days as well. John’s elder son, John Woodley junior, began his own family in Tedburn, but then moved to the neighbouring parish of Dunsford. John senior appears to have moved there too, perhaps when he was in failing health. He died there in 1634. 1634 April 11 John Woodleye. His will was proved the same year. This is not the burial of John junior, whose own will was proved in 1661. John senior was probably in his 70s when he died. He lived to see the accession of James I and Charles I, but died before the Civil War. H. Fulford Williams, thesis on Tedburn St Mary, 1965.